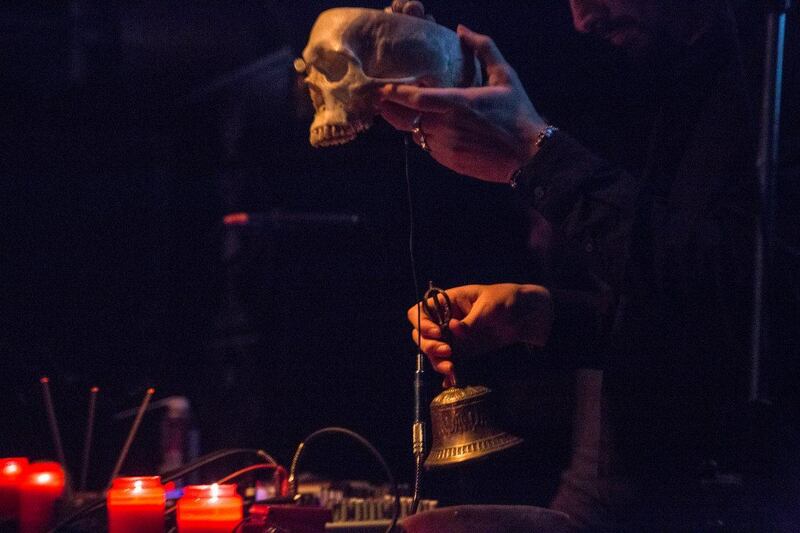 For this review, I’m proud to share with you the writings of a new associate of ours, Matteo Brusa, known to the dark ambient and dungeon synth communities for his work as Medhelan and La Tredicesima Luna. I’ve reviewed albums of his by both projects and I’ve also interviewed him. I know he has a much more thorough understanding of the dungeon synth genre than me, and therefore more authority to call a release good or bad. For this reason, among others, I hope he’ll be returning soon with more reviews for us of whatever albums he sees fit. Enjoy! 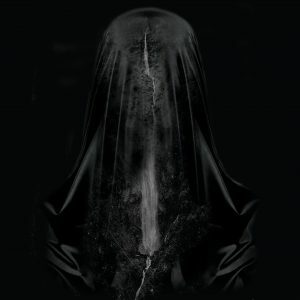 If you are into obscure dark and atmospheric music genres in 2019 and you’ve never heard of Dungeon Synth, you’ve been living under a rock. Since its inception as an offshoot of the Norwegian Black Metal scene in the early ’90s, the genre has gone through several phases, from its experimental beginnings in pure Black Metal spirit to its revival in the 2010s and subsequent growth, eventually gaining its current status of underground popularity, supported by an ever expanding international online community. This momentum, coupled with the relative ease of recreating a certain sound and aesthetic quality (albeit not necessarily the spirit), has produced in recent years an endless flood of mostly copycat Dungeon Synth projects, making it very difficult, with the notable exception of a few household names, to sort the wheat from the chaff. 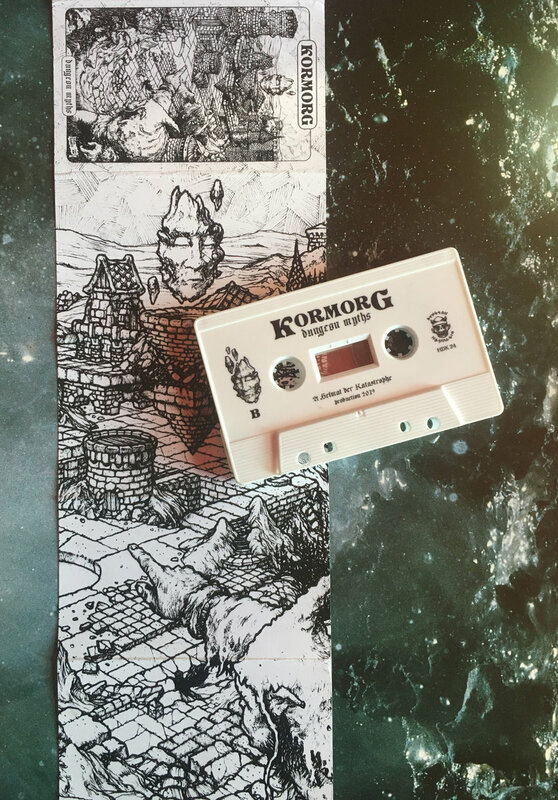 Released in cassette format by the Italian experimental label Heimat der Katastrophe and instantly sold out, KORMORG‘s apparently unassuming debut Dungeon Myths first catches the eye thanks to its lusciously evocative hand-drawn artwork, courtesy of veteran artist David Thiérrée; a quick glance to liner notes on Bandcamp reveals some more interesting details: first, we are told KORMORG is a new project by an unnamed well-known artist in the current scene; moreover, the album incorporates samples from several established acts (including my own work), suggesting a rather uncommon sample-based approach to composition. The most astonishing part of it, though, turns out to be the music itself: opening track “Awakening the orcs” sounds gorgeously deep, crisp and clean, showing off a painstaking care for detail and sound architecture which is way more common in pure electronic ambient music rather than Dungeon Synth; most of the sounds appear to be crafted by heavily editing various kinds of samples, a technique especially evident in background soundscaping, drones and percussion parts. The ambient-rooted, sample-based compositional style shines even more brightly in the following track “Preparing for battle”, which builds up an epic, heroic soundscape over a simple drone-like structure, and in the highly atmospheric closing track “Crystal lights in haunted caverns”. “The lonely maiden at a distant shore” is the closest this album gets to electronic down-tempo music, with its lonesome and mystical feel somehow reminiscent of early Delerium, while “Return of a warrior” shows a distinctly cinematic edge juxtaposed with electronic beats (a recurring stylistic choice throughout the album). 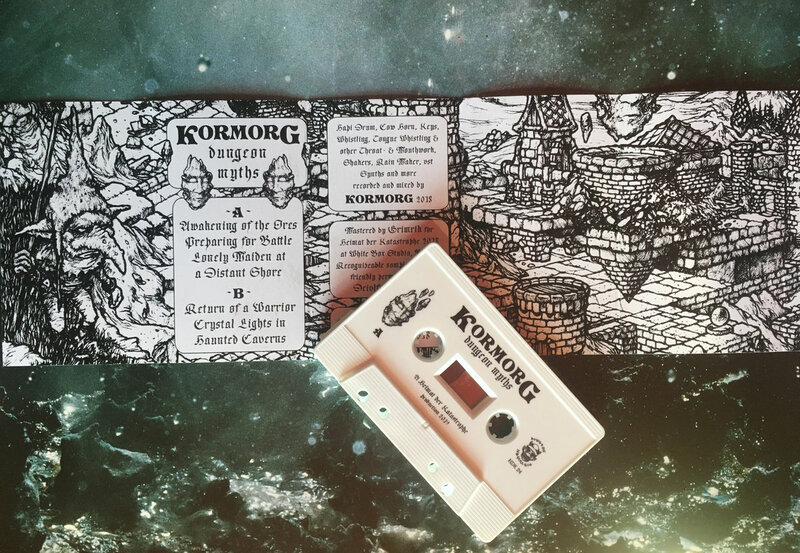 What really makes KORMORG‘s music unique compared to its peers is how, while clearly being professionally produced and composed with an electronic musician’s mindset, it still feels very much like Dungeon Synth, evoking the same kind of spirit and imagery found in the genre’s milestones. Dungeon Myths is probably the greatest thing happening lately to the scene: by combining a skillfully original approach to a deep knowledge of Dungeon Synth’s tropes and themes, while maintaining a respectful attitude towards its roots, it comes off as incredibly fresh, engaging and brimming with spirit, a much needed infusion of novelty in a genre quickly becoming stale. Highly recommended and definitely a highlight of this year. Rumor has there will be a re-issue, so be sure not to miss it again. 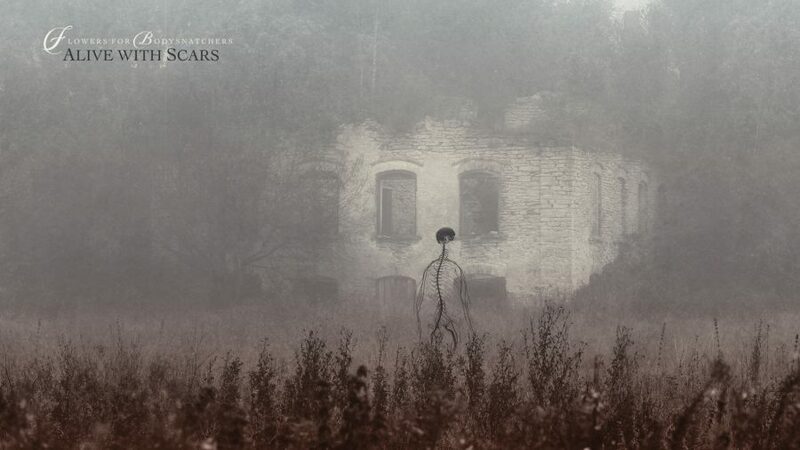 Flowers for Bodysnatchers is back with Alive with Scars. 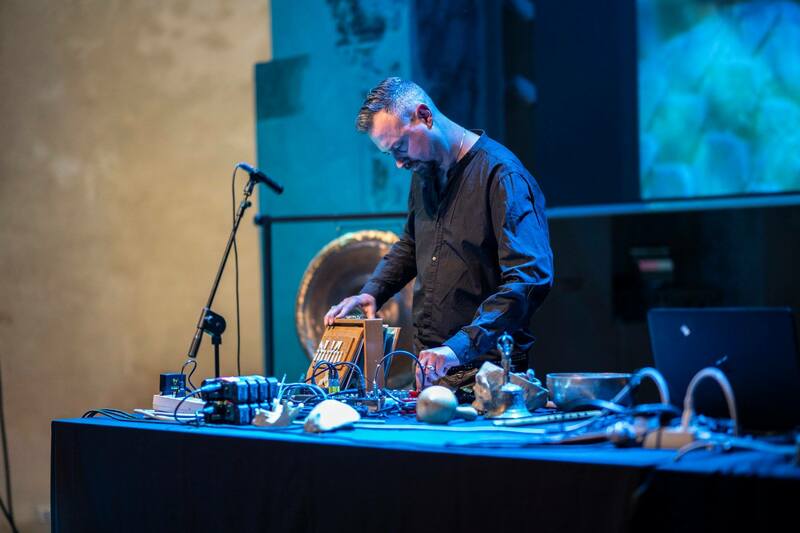 Duncan Ritchie’s project has quickly become one of the most well-known in the dark ambient genre and a front-runner on the Cryo Chamber label, which he’s called home since the masterpiece Aokigahara in 2015. His first two releases on Cryo Chamber showed a dark and personal side of Duncan Ritchie. Aokigahara took us on a journey into the forest of its namesake in Japan. This forest has become notorious and recognizable to many around the world in recent years, due to the more widespread reach of social media and news websites. It’s being featured in movies like A24‘s The Sea of Trees has only further solidified it in our minds. We knew that this was a sort of “potential suicide voyage” and the fact that Ritchie collected field recordings directly from Tokyo and the forest itself could lead us to believe that he may have taken this journey very seriously. Love Like Blood, the follow-up to Aokigahara, added more pieces to the puzzle for us. We found out that, at least part of, this trip was due to a lost love and the emotional reverberations felt because of it. The picture was undeniably a personal one for Ritchie at this point. Not just a theme for an album, but a saddening memoir. Alive with Scars takes us even deeper into the personal life of Ritchie. We are given a key to one of the underlying causes behind that eerie trip to Aokigahara. We find that the situation was not only one of personal incompatibilities and emotionally charged laments. Ritchie now shows us that a huge part of the puzzle comes from his struggles with MS. Here it is best to allow Ritchie’s words to speak for themselves, as he explains MS and his struggles in dealing with it. 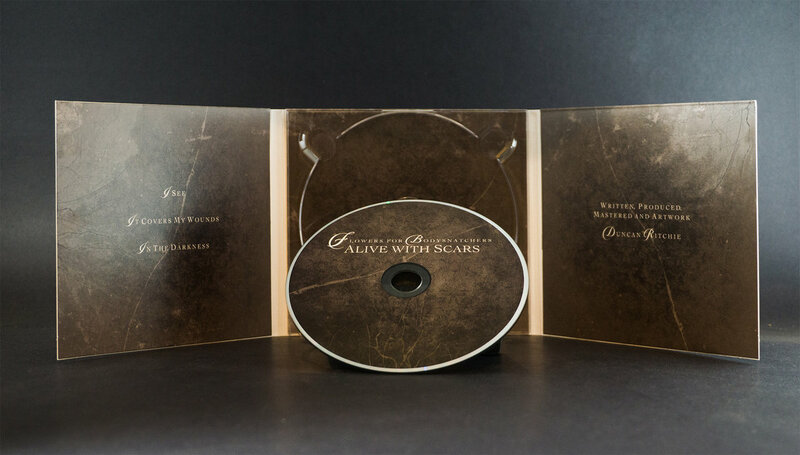 Alive With Scars is an album that explores the life long struggle of living with Multiple Sclerosis. MS is an autoimmune disease where the body’s own immune system attacks and destroys healthy tissue, in the case of MS, the healthy tissue is myelin, the protein that insulates the nerves in the spinal cord, brain and optic nerve gradually destroying the myelin that coats the central nervous system. Your body slowly beings wasting from the inside out by the subversion of its own central nervous system. A body that with the passing of time will waste and wither to its own unique sonnet of pain and torment. This all makes a lot of sense when listening to the album, especially if you are familiar with Ritchie’s previous work. There are certain sections, like the piano on the opening track, which harken back to previous works by Ritchie. The fact that he’s been working through the material of this album for almost this full ten year period explains how some of the tracks will seem like things unusual to the Flowers For Bodysnatchers repertoire, while others will feel like they were taken directly from the sessions for Aokigahara and Love Like Blood. Some could be older pieces from styles which Ritchie has since distanced himself, while others could be glimmers of the future of the project. From a technical standpoint, Alive with Scars is very much an active listen, more so than maybe any of his previous releases. This is particularly so because of the vast number of styles incorporated, as well as the several in-your-face uses of electronic percussion. It is also interesting to try to pieces together what elements may be time-capsules from several years ago, and which other ones seemed to be created/recorded over the last year, in preparation for the final album. I see no point in going into detail here on a track-by-track analysis. I rarely read them myself when digesting someone else’s review. The reviewers feelings about a track aren’t what’s important, yours (the listener) are. Suffice to say, I highly enjoyed each track on the album, and there is quite a bit of variation present in style, flow and emotion. Which is all to be expected when documenting the journey through physical (and so often as a result, also emotional) pain. Unlike most releases on Cryo Chamber, but par for the course with Flowers for Bodysnatchers, the album was 100% created and realized by Duncan Ritchie. From field recordings and synths to artwork and mastering, this is from the heart of Ritchie himself. I always consider that a real testament to his talents, when such a skilled person as Simon Heath is usually the one behind the artwork and mastering. Heath is absolutely ruthless when it comes to details and final product, so there is no way he would allow an album to be released on Cryo Chamber that wasn’t mastered by himself unless he really trusted and respected the work of Ritchie. I can highly recommend this release. But, don’t expect it to be one that you just put on in the background while reading. It won’t do the album justice, and it will likely distract you if you are studying or reading. Give this one an hour in the dark with a nice set of headphones. It will be an hour well spent, and one sure to be followed by many more visits with this episode in the story behind Flowers for Bodysnatchers. It is with immense pleasure that I am able to bring you an (heavily) updated version of my previous Skeldos review. As I lamented in the final paragraph, Skeldos is a brilliant musician and one that was deserving of much more exposure than previously realized. While my review, at the time, may have helped a few extra people find their way to and purchase this beautiful album, it was still sadly left under-the-radar. Now, finally, Skeldos has found a proper label, The Epicurean, one that is well-respected within the post-industrial community, which will likely bring his music to the attention of a much larger audience. As it so greatly deserves. For this re-release Skeldos has added a third track to the album “Blunkantys Sodai – Fading Gardens” and the album has been renamed Ilges – Caretakers of Yearning. It has also been mastered by Hunter Barr, and is now available as a CD. But, more on the physical aspects later. Skeldos focuses on a form of drone/dark ambient which at times can be incredibly relaxing and calm. But it can move into varied territories with little awareness from the listener. The sounds seem to morph effortlessly. While the music itself can sound a good bit different at times, the approach to these soundscapes seems quite reminiscent of Kammarheit, or some amalgamation of Kammarheit and Taphephobia, maybe. Or at their harshest of times (not present on this album) can come into territory more aligned with artists like Jarl or Yen Pox, creating textures which can seem chaotic and over-bearing, but are still able to totally draw the listener into their coils, taking us on a mental voyage to destinations unknown. An interesting caveat here is that it would appear Skeldos creates all his “drones” with real acoustic instruments, namely on this album: accordion, Lithuanian zither, violin and guitar. The first track on Ilgės, “Melas – A Lie”, falls somewhere in the middle of Skeldos‘ range of soundscapes. There is a slight harshness, but it is predominately a sort of trance-inducing dronescape, which has little variation, and yet has managed to keep my full attention over many, many replays. I could maybe lightly compare the style to something more reserved on Aural Hypnox. The second track, “Ilgės – Caretakers of Yearning”, takes us into calmer, more melancholic territory. The backing dronework has a sort of celestial/shimmering/peaceful quality to it, which is accentuated by its solitude within the track. As listeners begin to sink into this trance, Skeldos introduces, for the first time on Ilgės – Caretakers of Yearning, what I think is his most defining characteristic. His vocals. Skeldos has a very relaxing mid-deep ranged vocal quality. His vocals sound as if they are a lullaby, cutting through the darkness of night, in a sort of melodic whisper. As we reach the end of the track, the energy of the soundscapes, as well as Vytenis‘ vocals, pick up momentum for a more emotional finale. The third track, “Blunkantys Sodai – Fading Gardens”, is the new addition to the album, as mentioned above. I’m not sure if this was an out-take from the original sessions or if it was created exclusively for the re-release. But, it fits perfectly with the first two tracks. The soundscapes follow a similar pattern to those of the previous track and we are again graced with another short but beautiful vocal section. The inclusion of this new track brings the total album length to a more satisfying 45 minutes. The inspiration for this album was taken from the poem “melas” or “A Lie” by Lithuanian writer Antanas Škėma. As with the previous version, the poem/lyrics have been included in the digifile, in their original Lithuanian as well as in English translation. While the poetry of the first track was written by Antanas Škėma, the second two tracks have lyrics/poetry composed by Skeldos himself. The cover-art for this version has been updated, but is still very similar to the original. 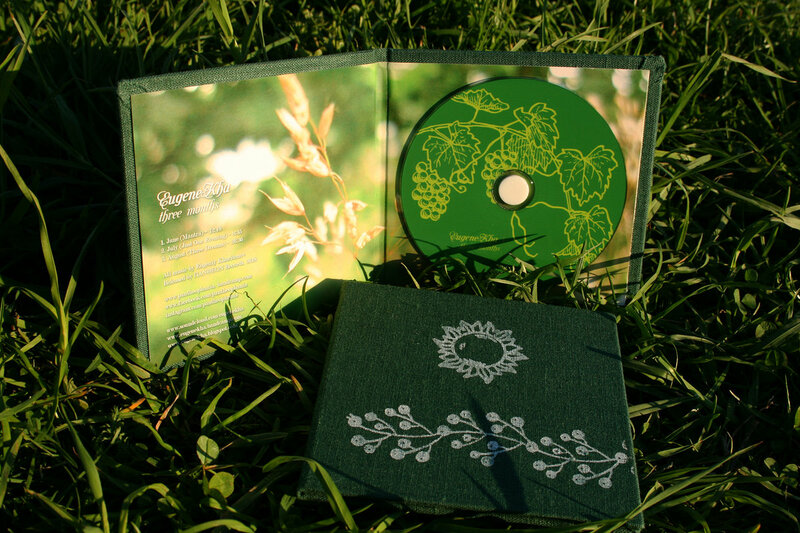 The CD is housed in a beautiful 6-panel digifile made with high-quality natural paper. The special edition, which is limited to 25 copies, takes this “natural” element one step further. 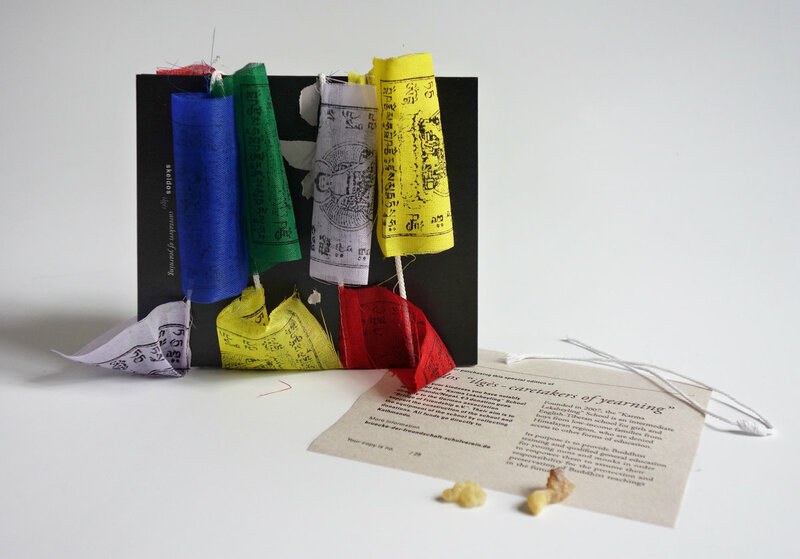 It includes the same digifile as the standard version, along with: Tibetan prayer flags, incense, refuge ribbon & a certificate for donation on joss paper. Skeldos is a true gem to the post-industrial community. There is an air of the ancient and folk, and a feeling of melancholy which many dark ambient and drone artists can only dream to achieve. Each time I listen to Skeldos I am reinvigorated by the wonders present in his soundscapes. I am beyond pleased to be returning to this wonderful release with its additional track, new mastering, and beautiful new physical presentations. I highly recommend this album, HIGHLY! I will hopefully have an interview with Vytenis to share with you all in the near future. I’m very much looking forward to picking his brain! New Zealander, Abby Helasdottir has been known around the dark ambient and post-industrial scenes for quite some time. She has a well-known dark ambient project, Gydja. But possibly more important to the scene has been her work in visual arts creating cover art for quite a few albums, many of which you’ll find on the Cold Spring label. I follow Abby on Facebook and I noticed recently that she was doing frequent mini-reviews of releases from the ΠANθEON record label. Having also enjoyed and agreed with her sentiments regarding many of these releases I asked her if I could compile them all in this article, once she was finished. Her answer is now obvious! “ΠΑΝΘΕΟΝ (or Pantheophania) is a Russian D.I.Y. 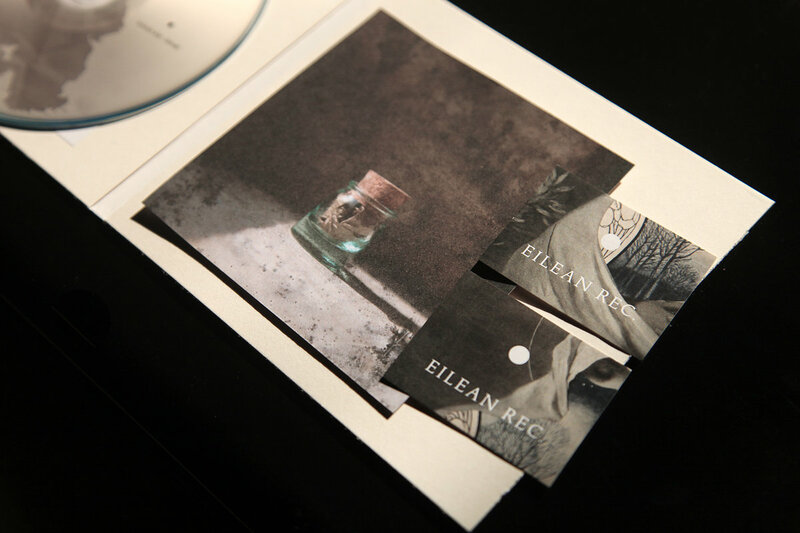 label focusing on handmade editions of cassette tapes, CDR’s and CD’s, as well as digital-only and disc-on-request releases. While each review is “mini” the collection certainly is not! Most (maybe all?) of these are available for “name your price”, but many also have beautifully crafted physical editions still available, some only 1-2 left on Bandcamp, so think about showing them some support if you dig these albums! I don’t usually buy entire digital discographies from labels on Bandcamp, especially if they’re large, as they tend to overwhelm the carefully curated library page, but how can you say ‘no’ to 107 releases from ΠANθEON. So many great releases. One of my favourites is the Creation VI‘s October Rite – just love how it strays into Aural Hypnox type territory with its otherworldly drones. Listened to that one multiple times already. Now to gradually download, unzip and listen to 107 albums. Been making my way through the recently purchased ΠANθEON discography, and while all of it is good, some of it is spectacularly good. So until I forget to do it, I’ll highlight a few of the, well, highlights. 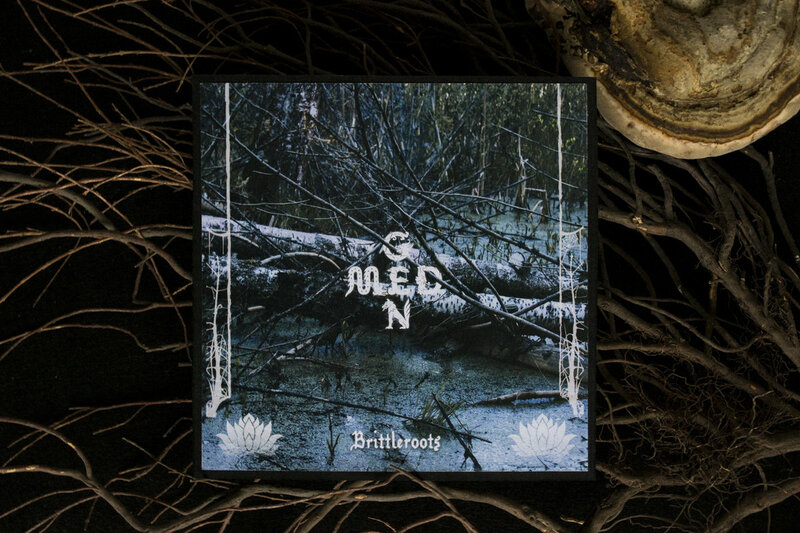 The unmemorably-named Med Gen are anything but with their album Brittleroots. 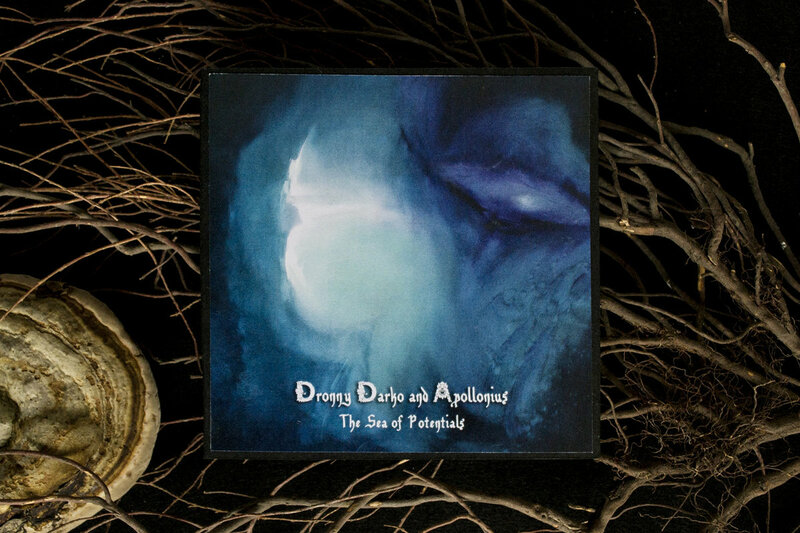 Responding to the album’s theme of swamps, there’s a lovely, dense and deep murky quality to the sound, especially on the opening “Peat Accumulation” which seems custom-made for my ears: part chthonic, part aquatic, more deep texture than musical. Little bits of field recordings add some relevant details to the drones but what really stands out is that dense, dark, slightly drowny palette. 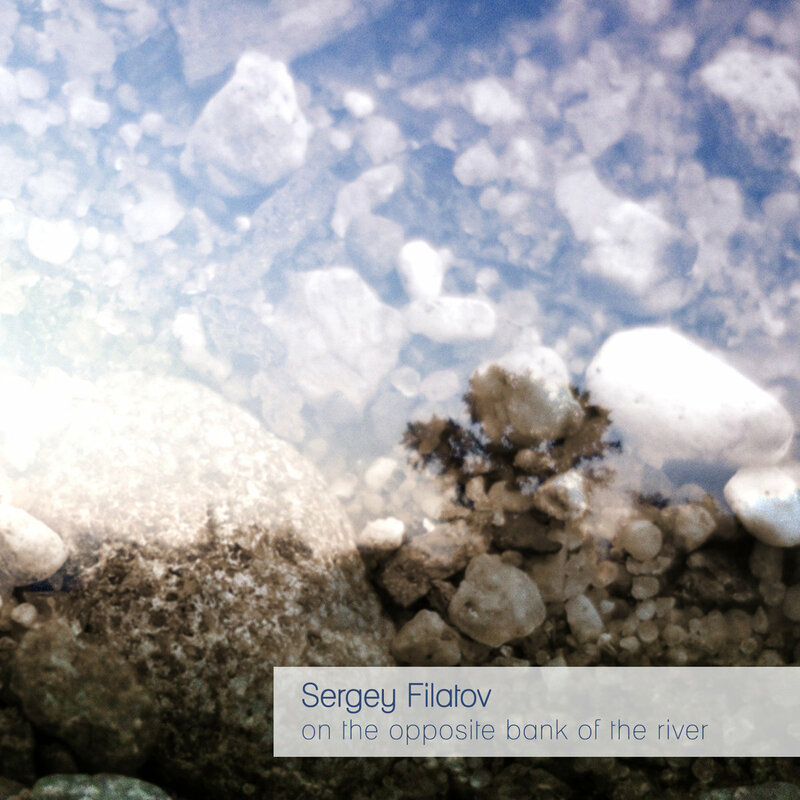 Sergey Filatov is not one of the more familiar names on ΠANθEON (just 71 listeners on last.fm) and this two track album is certainly not one of the label’s more jump-out-and-grab-you-by-the-throat releases (if any ambient can do that). Instead of overwhelming you with activity, On the Opposite Bank of the River wins you over with its determination to be indeterminate. 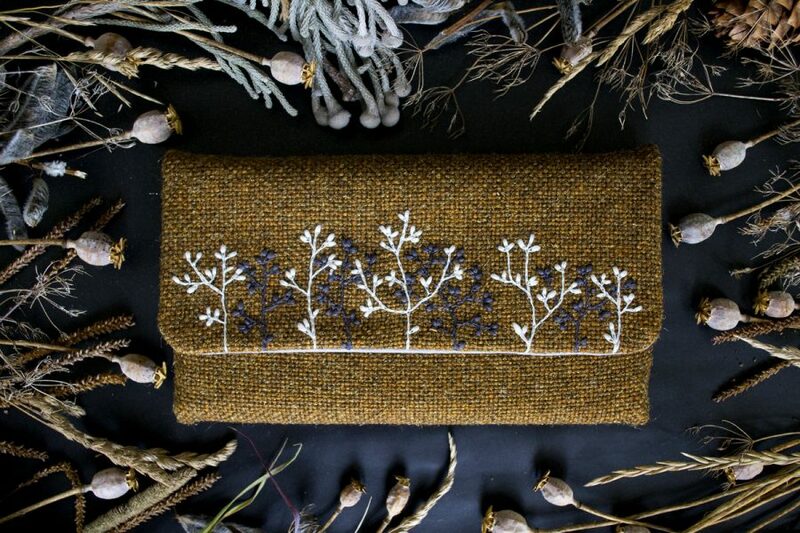 Like the river of its title, it just meanders… gloriously. Much like a lot of work by Alio Die, it sort of lingers, hanging in the air, little melodic chimes patiently pulsing pastorally, with no real sense of momentum. Which is all great. Field recordings are buried in the sound and only sometimes bubble to the surface: a prerequisite stream or brook, some lovely birds clean and clear in the mix. Most of the time, though, the nature it depicts seems to be off in the distance, indeterminate but present. One of two releases from Mrako-Su on ΠANθEON, Грани Зимы consists of six tracks, two under seven minutes and the rest over eleven, with the longest, “Ветер в груди”, clocking in at 18:30. While in my own music I have a tendency to add as many layers into the mix as possible (either to stave off inattention or insert additional esoteric nuance, cross fingers), I have always loved music that strips things back, and that’s what Mrako-Su does here. The tracks principally use a flute sound of some type, presumably slowed and processed in places for lower layers, but otherwise quite up front. It’s not played melodically, more tonally, and that’s something that also appeals; I’m not here for the chunes. There’s a patience here, with things taking their time to come and go, rise and fall, often eschewing any need for too much structure. And that’s one of the important things, because the music with its flutes and occasional drums and mouth harp, plus a slightly tundral vibe, feels very shamanic – but not in that smooth, processed way that needs to turn these aural elements into catchy, conventional songs. So yeah, it’s slow, it’s subdued, it has lots of flute and feels shamanic without needing to break into a Wardruna floorfiller. In my summary of Mrako-Su‘s Грани Зимы, I mentioned how much I like simplicity and minimalism, but the converse is true and that’s exactly what you get with Three Months by EugeneKha. In some ways, Evgenij V. Kharitonov uses comparable themes, if not the exact sounds, as Mrako-Su, mining a similar vein of, to use a slightly dreaded nomenclature, ethno-ambient, with hints of shamanism and nods to nature (aesthetics that are somewhat baked into the ΠΑΝΘΕΟΝ label). The sound, though, is completely different, with each of these three tracks, representing the months of June, July and August, using prominent, wide-open drones that fill the space, creating a thick, dense, somewhat all-consuming sonic cocoon. The twelve minute “June (Mantra)” builds its density slowly, beginning with slightly windswept tundral hums to which rattles (or rainsticks), chimes and whistles (all perfectly reverbed for body without muddiness) are gently added, reaching maximum density with the addition of a pulsing didgeridoo tone, followed by a subtle melodic figure and a concluding hand percussion pattern buried in the mix. While “June (Mantra)” revels in its complexity, with each sound continuing to run once it has been gradually added, “July (Just One Evening)” begins with many of its elements in place, and then drops these out to a core element of a brooding tundral drone, waves of wind and a high pitched wash that is, or at least recalls, the metallic chirp of cicadas; whatever it is, its a tone and a frequency I’m very partial to, and I love the way it builds to take up all the sonic space so gradually that you only really notice when it ends and the silence is so deafening. That “July (Just One Evening)” reminds me of my own track “Wolfszahn” may be why it emerges as my favourite on the album. “August (Three Dreams)” uses its 26-minute length to play with things at a slower pace, using a drifting, ever so gradually evolving drone that feels more Roachian than obviously dark ambient. This suddenly shifts at fifteen minutes into a clearly demarcated second section where percussion takes over to explore the more rhythmic, Byron Metcalf-esque side of the ethno-ambient sub genre. A few other sounds are briefly introduced and farewelled against the persistent beat, until it loses out to one of these, water sounds, which rise to prominence before the song and album end with a vocal coda (the album’s first obvious use of voice). The ambient nature of a label like ΠΑΝΘΕΟΝ lends itself to long-form music, with many releases clocking in at over an hour. That’s not that case with Liquid Silence/A New Beginning, a split release from Sunhiilow and Сон Чайного Дерева, with almost all the tracks hovering around the 2-3 minute mark, except for the aberrant 19:44 of “Liquid Silence”, one of the two tracks here by the Сон Чайного Дерева duo of Aloe and Tim Six. “Liquid Silence”, you may be interested to know, is not silent and is instead a lovely slow-moving drone that hints at Angelo Badalamenti‘s “Laura Palmer’s Theme”, while its shorter companion, “Sitar Rain”, sounds like exactly that, sitar and rain; well, more of the former than the latter. Finland-based Sunhiilow takes up only a little more space than Сон Чайного Дерева on this release, but makes more of an impact due to her contributions consisting of nine tracks. Given their sub-three minute length, all of her pieces have little chance to build or go anywhere, and as a result, feel like snapshots or vignettes of sonic environments. Which isn’t a bad thing. Maybe I’m taking too many cues from the nom-de-musique, but there’s a solar quality to these sounds, a pastoral sunniness, all chimes and light tones. The brevity of each piece means that they’re better considered as parts of a whole, three-minute glimpses of a place that can be made from any angle or time, or in any order; kind of a longer-format version of Eluvium‘s “Shuffle Drones” but with fadeouts. Astrolabe has always been on my “that would make a great project name” list, with its combination of nods to the stars and with those, the future, but still tethered to a dusty, archaic past due to the use of the tool since before the common era. So does this Astrolabe sound like an astrolabe, does it sound like it could be “the one that catches the heavenly bodies”? Not really, there’s nothing particularly spacey about the palette used here, and there’s no clanging of equipment in an old astronomy tower. Instead, Lights Beyond The Mist traffics in a refined, linear brand of ambience, its tones light and airy, feeling very much like the photonic haze that adorns the cover. With two supra-twenty minute tracks twinned with two shorter ones at 10:11 and 8:31, the album acts like a concentrated dose of Astrolabe‘s style. And that style would be drifting. There’s never much sense of urgency, never any interruptions, and what there is in the way of perceptible evolution often sneaks up on you. So while “Hideaway” gives way for half its ten-minute length to an aquatic scape of trickles and streams, or the 23 and a half minute “Fragoline” climaxes in an almost space ambient roar, it’s often just the gorgeously refined light drones that stick in your mind, set against broader rumbling basses that you can feel are there, but are not in your face, erm ears. As such, track titles and times seem largely arbitrary, and its easy to just get deliciously lost between all four. 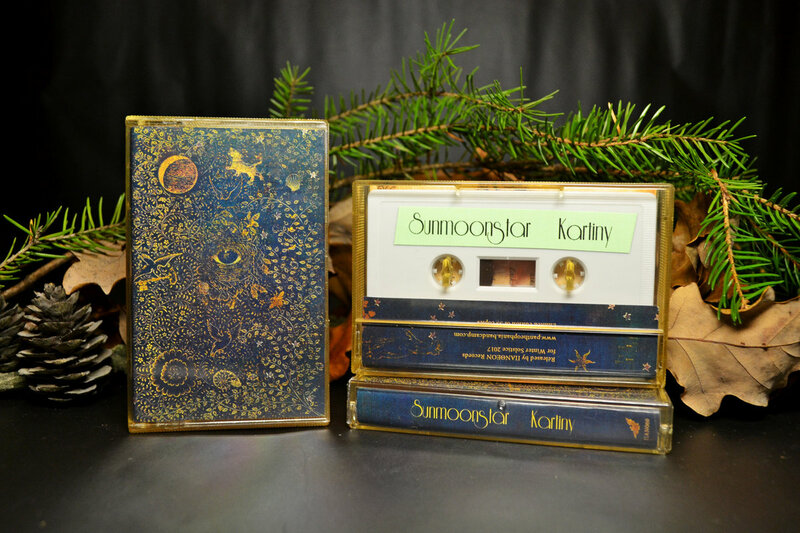 ΠΑΝΘΕΟΝ owner Tim Six has a professed love for that most maligned of genres, new age music, and this release from Floridian Natasha Home’s Sunmoonstar is perhaps the most new agey release in the label’s body of work. The aural palette should be familiar to anyone who has spent even a little time around that genre, all chiming tinkles, plaintive rhodes-like keys, thin airy pads, and whispy synthetic flutes. There’s almost nothing contemporary about what appears here, with even the production keeping things simple and not making use of any of the tricks that may not have been available to producers of yesteryear but are to anyone today. And that’s a good thing, in fact, the whole thing is lovely. Like much new age music, which can have an admirably punk-like amateurish quality to it, the music on Картины often just hangs there, with no conventional song structure, no forward momentum, and no repetition of catchy melodies. With seven tracks rendered interchangeable with their titles in, for me, indecipherable Cyrillic, it’s all over too quickly after 30 or so minutes. Plus the cover design by Home herself is gorgeous, if devoid of any of the new ages aesthetics heard in the music. It’s kind of cheating to choose to review an album involving Mathias Grassow as you know, no matter what, it’s probably going to be decent if not great, and there’ll be a certain standard and sound. And yes, that’s what you get with this collaboration with Russia’s Closing The Eternity. The credits don’t say who did what on which track, but the 12 minute opening “(When) There Is None” is very much a typical Grassow piece, all resonant, crystalline drones, whereas the almost 17 minutes of “Schorl Vugh” incorporates various organic elements (squawking discordant flutes and chimes) against a static drone. The brief one minute interlude that is “Forsaken Well” brings the latter part of this approach to the fore with percussive and atonal clangs and bangs that then gives way to the album’s longest piece, the 30 minute and majestic “The Great Elaphe”. 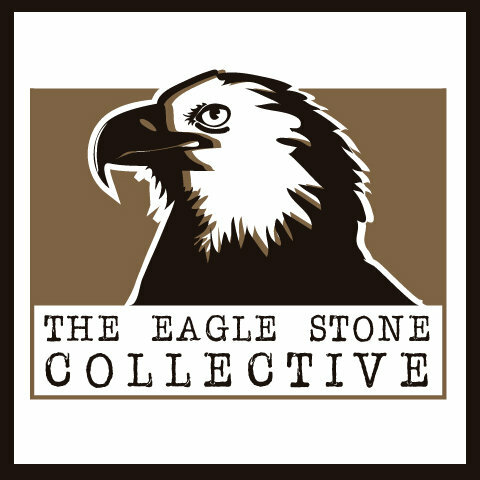 Somewhat bringing elements from the three previous tracks together, “The Great Elaphe” gets going straight out of the gate with a warm rising drone, overlaid with a mouth-harp-like twanging drone, and a sense of momentum created with a drum beat buried down in the mix and a shake of a rattle above. 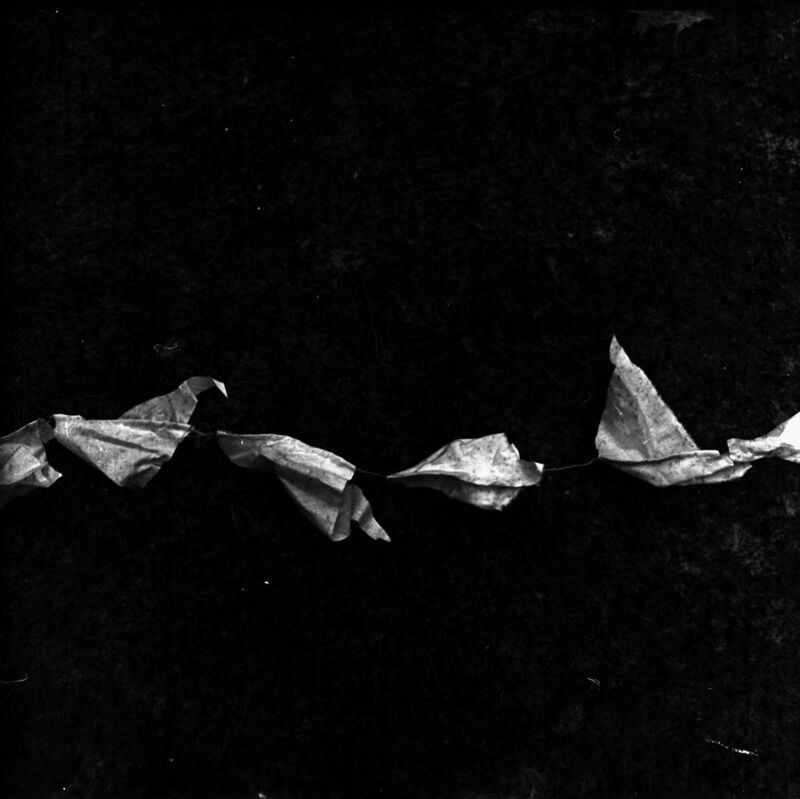 This evolves into several distinct movements, the pace dropping away to open different locations, the warm drone always present, in which various elements are introduced: a pensive moment into which darker drones are introduced, the return of the subtle drum beat and rattles, a foreboding chthonic sequence at 17 minutes with menacing tones like a dungchen trumpet. 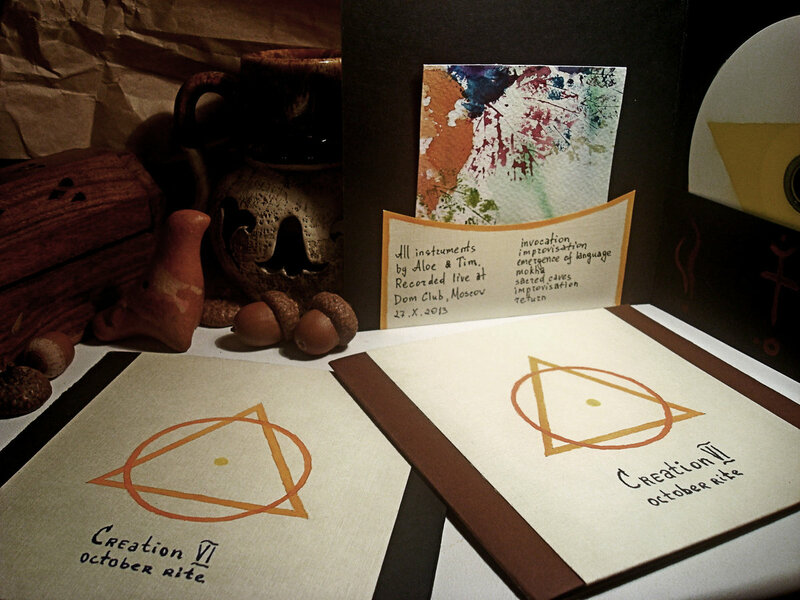 There are a wealth of titles by Creation VI in the ΠΑΝΘΕΟΝ catalogue, which is understandable given that the label is run by the duo’s Tim Six. As such, it might be hard to pick out a highlight, but for me, it’s October Rite. Recorded live in 2013 at Dom Club, Moscow, it contains improvised versions of some previously released and unreleased tracks, all presented and indexed as a single piece. As such, for the first five minutes, the sounds are accompanied by the slightly distracting mutter of audience sounds (unless that’s part of the track), until they are overwhelmed by an unassailable rising organic drone. This drone builds and evolves over the first 39 minutes of the track’s 53-minute length, always with a bassy rumble to it, with additional organic elements, percussion and voice, weaving in and out of the bed of sound. This addition of sound and the relentlessness of the drone creates an hallucinatory sensation and at the 30-minute mark you realise you have entered territory worthy of Aural Hypnox acts such as Zoät-Aon and Halo Manash. It’s here that the drone and its additional layers have that eldritch alien quality that is so evokative of the sounds of Aural Hypnox, giving the impression of slipping between worlds, or of something waiting in those spaces, about to come through. This section ends with a single audience woop and the rest of October Rite takes a slightly more sedate approach, resonating metallic tones and drones bringing things to a reflective end over 13 minutes. Despite having perhaps one of the cringiest monikers in ambient, Ukrainian Oleg Puzan has made a significant impact as Dronny Darko, most notably with a series of albums on Cryo Chamber. Here he teams up with Eelke van Hoof, AKA Apollonius, of the Netherlands, with four tracks, all neatly coming in between 15 and 20 minutes. As the cover art implies, there’s a glacial quality to the material here, suggesting that the titular sea of potentials is frozen. Washes of icy wind, rising crystalline tones and rattling chimes interweave on “Drift”, but things do get warmer on “Lost” where, although there’s still a chill in the air, the ice seems to melt, with the mutterings of water rising into the mix and pads becoming rounder and friendlier. Across the two remaining tracks, the feeling of coldness never really abates, but in the final “Realign”, thicker ever so slightly warmer pads emerge against an opening bird-like cooing, alluding, perhaps, to a slow autumnal dawn. 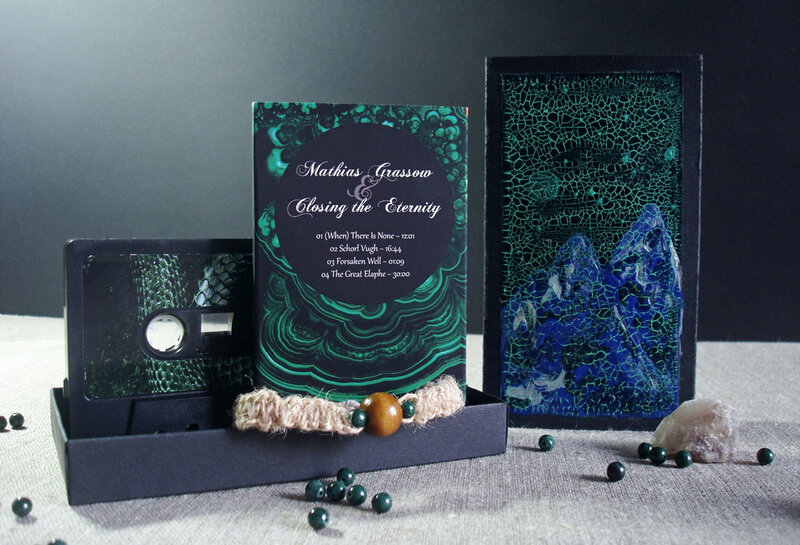 With a similar palette across all four similarly paced songs, The Sea of Potentials rewards carefully listening, without which this lovely considered slice of arctic ambience can pass by unjustly unnoticed. With an instrument list that includes synthesizers, three types of guitars, ebow, digital piano and accordion, in addition to the usual textural sound generators like ocarina, hulusi, wooden flute, shells, rainstick and bells, this album by Andrey Vasilyev’s Fellirium has a different, perhaps more ‘musical,’ sound to many of the releases on ΠΑΝΘΕΟΝ. The use of guitar recalls the work of people like Jeff Pearce, Christopher Short from Ma Ja Le, Eric Kesner’s True Colour Of Blood, or Steve Roach’s occasional guitar experiments, with Fellirium using similar techniques to create washes and elongated chords of glistening ambience. 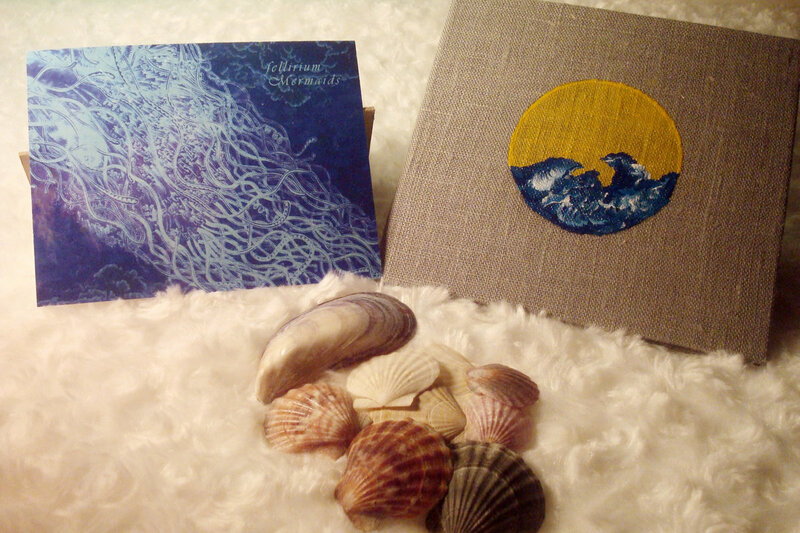 While it may mean I’m just easily led by the album and track titles, there’s a palpable feeling of the sea and ocean in Vasilyev’s aural palette, a hazy sense of light reflecting off vast expanses of water, of swells and ripples and the depth beneath. And that’s without any obvious use of water samples. Sometimes these washes and swells are given a little sparkle with the addition of a rattle of bells or shells, but for the most part, it’s just the beautiful nubilous ambience. My final mini-review highlight from the ΠANθEON discography; had to end it somewhere or I’d be listening to nothing but for a long while. In the folder name, this split release is listed as being from Ugasanie and Spiral of Time but the tags give both artists’ names in Cyrillic as Угасание and Спираль Времени, so I’m happy for the folder title otherwise I’d never remember who it’s by. 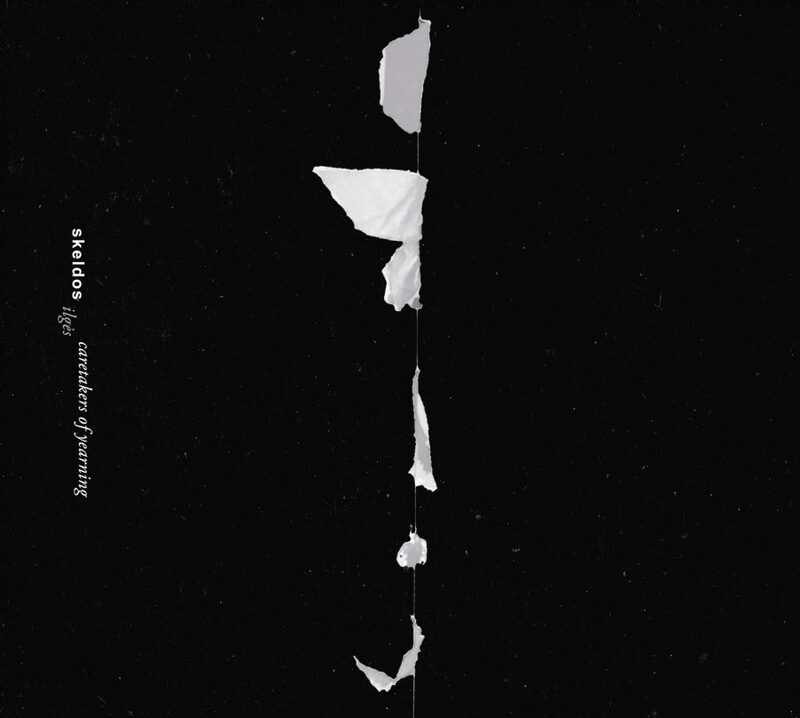 В Отзвуках Эха by Угасание and Спираль Времени (I’m already confused) consists of five tracks each from both artists, presented in its physical format in what looks to be a lovely cloth digipak with a labyrinth painted or stamped on the front. The tracks from Спираль Времени (Spiral of Time), who I’m not familiar with, are denser and murkier than those of Угасание, although both artists do seem to share a similar theme of isolation, with titles that reference places like Onegaborg in what is now the Republic of Karelia and Murmansk. With the exception of “Онегаборг”, which features a prominent dungeon-synth-style melody for its duration, the Спираль Времени pieces are, for the most part, textured sound paintings that lean towards industrial ambient with their aural choices and treatments. The Угасание quintet of tracks have a more sedate manner, feeling less refined and rarefied than the series of releases on Cryo Chamber, but incorporating the same themes and aural aesthetics, all wind-swept tundra and icy isolation. “Two weeks you’ve been scouring the Arctic Sea. No sun since you reached the North, the dark water a constant fractured mirror that meets the universe above and pulls you into its black fold. Everything points to “it” resting beneath the ice, in a slumber of centuries. 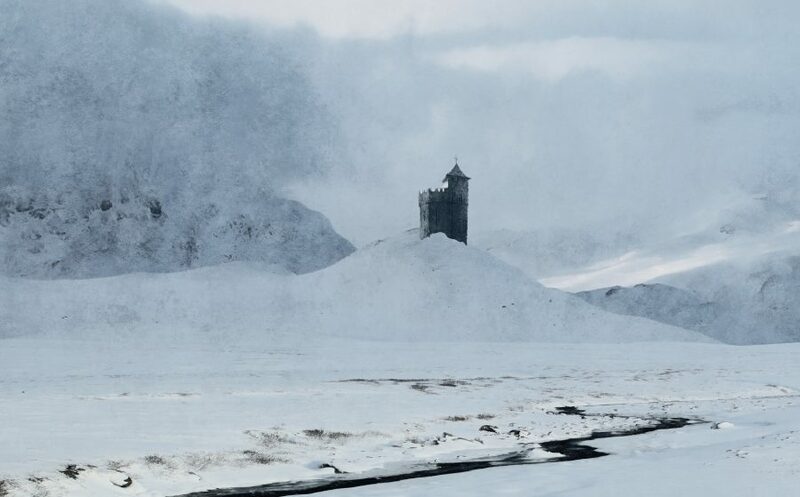 After Northaunt, Ugasanie (Угасание, which my Belarussian friend has told me is pronounced Ew-Gah-Shay-Nee-Yuh, and which means something like ‘fading away’ in English) was the second “polar ambient” artist with which I fell in love. Pavel Malyshkin of Vitebsk, Belarus has been creating music since around 2010 under this name, with a few solid early albums before he was discovered by Cryo Chamber in 2013 and released the classic White Silence. Since then, Ugasanie has become one of the most well known polar ambient artists within the greater dark ambient genre. He also runs two side-projects: Polterngeist and Silent Universe. Oleg Puzan of Kiev, Ukraine also came to prominence with his first Cryo Chamber release as Dronny Darko, Outer Tehom, in 2014. 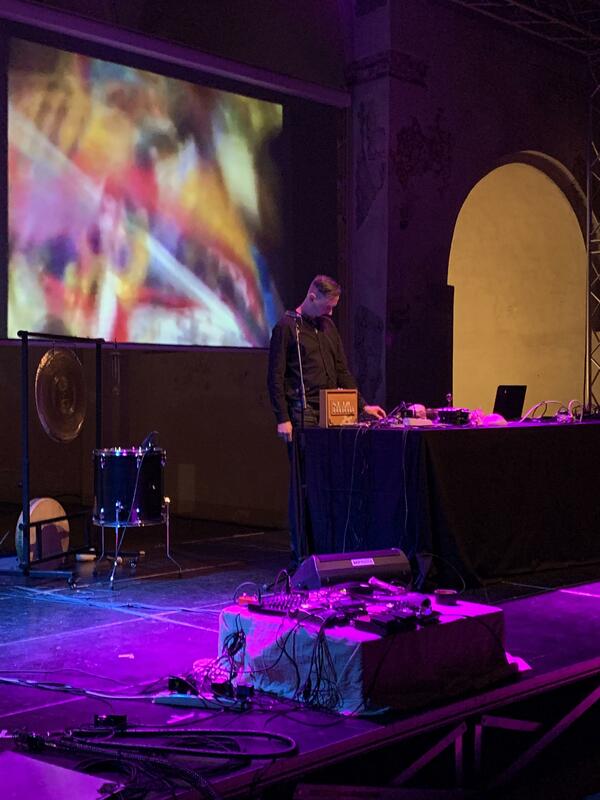 Since then, he’s created a vast catalog of albums covering a multitude of styles within the dark ambient genre. He also mentored his now wife and mother of his child, Sasha Puzan aka protoU, who has released a number of solo albums on Cryo Chamber as well as excellent collaborations with Dronny Darko and others. He also has a few side projects of which I particularly enjoy Cryogenic Weekend and Hivetribe. With Dronny Darko known for his attention to detail using drones and field recordings to create exquisitely nuanced soundscapes, and Ugasanie‘s mastery of the far northern landscapes/soundscapes, we should expect something extra special here! If the amount of times I’ve played this album on repeat over the last few days is any indication, this one is a gem! The theme takes us to the far north, into the Arctic Ocean, not far north of Svalbard (Spitsbergen), the massive archipelago which has been under Norwegian sovereignty since 1920. The album blurb tells us that there are people searching this region of the Arctic for “it”, which has apparently been slumbering beneath the ice for centuries. This scenario seems to hint at something like a Cthulhu type entity for which the explorers search. It seems that they find signs of what they seek around the GPS coordinates given as the title of the fourth track, “80T-54’08.8N 49T-51’38.3E”. 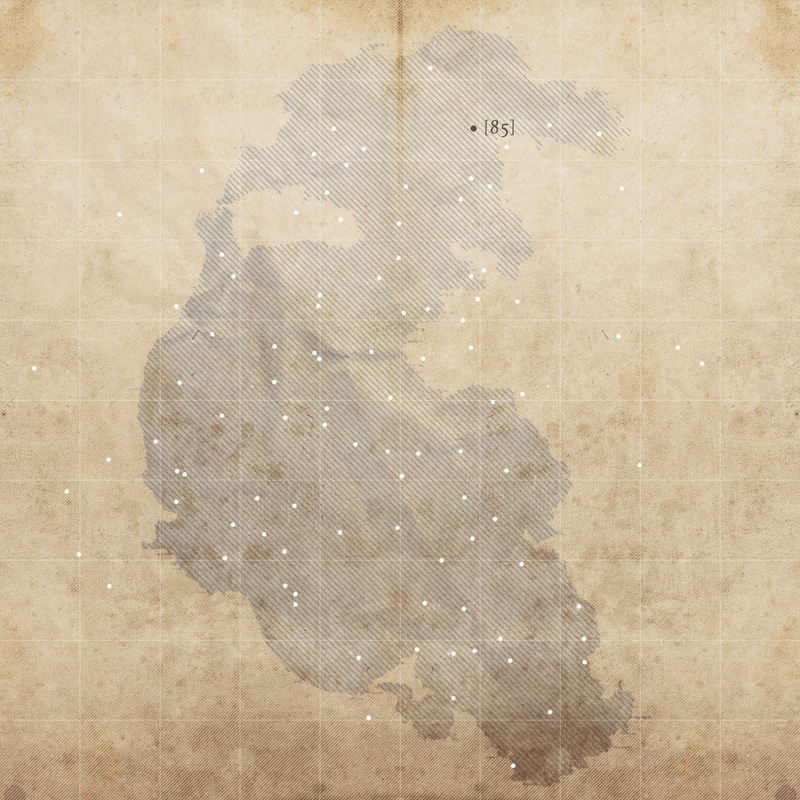 I’ve shown these coordinates on the map below. I’m having a hard time connecting the narrative in the song titles to the narrative in the album blurb. 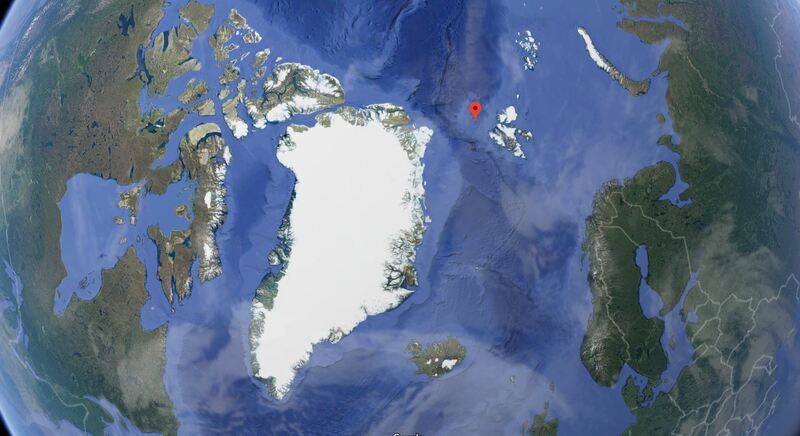 But it seems that the explorers are searching this area by boat in the middle of dark winter (that time of year in the polar regions when the sun sets and doesn’t rise again for weeks/months, depending on how far to the extreme north or south you are). At some point, the explorers wreck their vessel (likely into floating glacial breakaways or the solidifying sea itself). However they move on. They find their way into a shaft, beneath the ice, possibly beneath the frozen sea itself. Until they reach land and ‘The Arctic Gates’. Whatever great mysteries are revealed to them in these depths should be left to the listeners’ imagination. 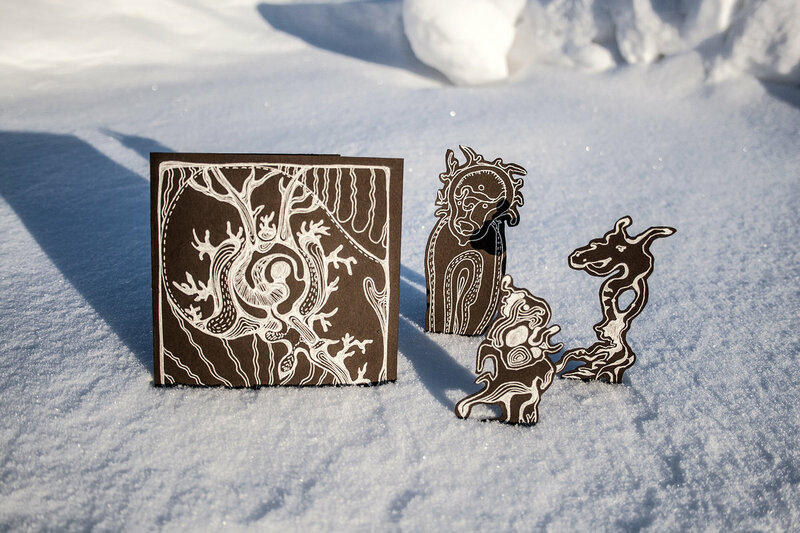 From a technical perspective, Ugasanie provides brilliant field recordings, which are able to bring this treacherous and frigid northern climate to our headphones. We can feel the gusts of wind, the creaking glaciers, the flexing ice. But, there is much more to this journey than an unwelcoming frozen environment, there is also dark energy, possibly dark gods. 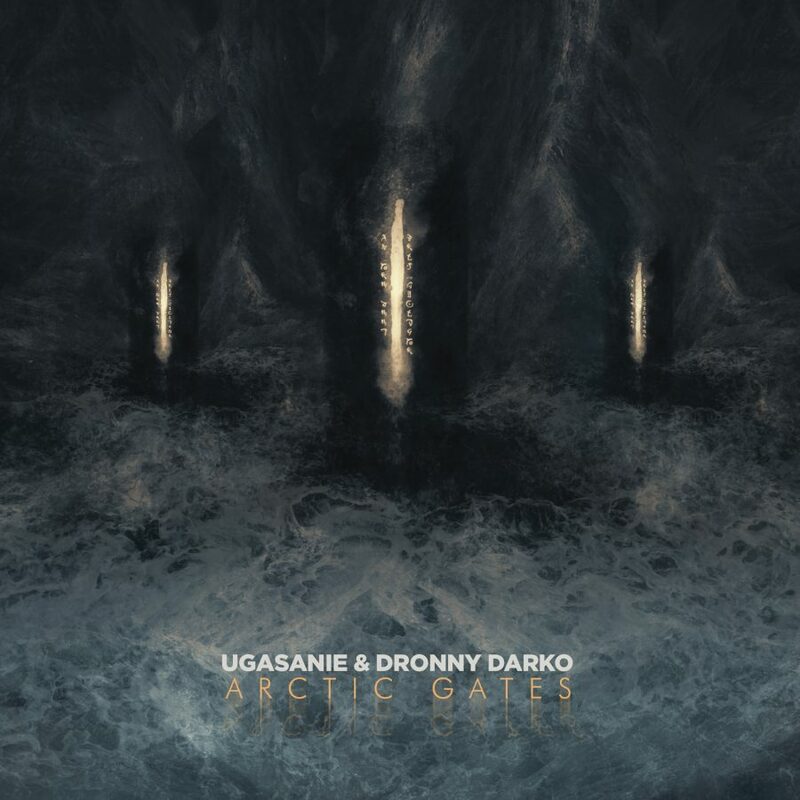 Dronny Darko takes the helm on bringing the events and encounters to life within Ugasanie‘s world. The results are magnificent. Both artists show a perfection of their styles here, allowing me to close my eyes and bring this cinematic experience truly to life. I’ve honestly felt the cinematic elements of Arctic Gates more intensely than most other albums in the last two or so years. Aside from Eximia‘s Visitors album, I haven’t had so much fun trying to piece together a plot since the last time I sat down with the Atrium Carceri discography for several days straight. 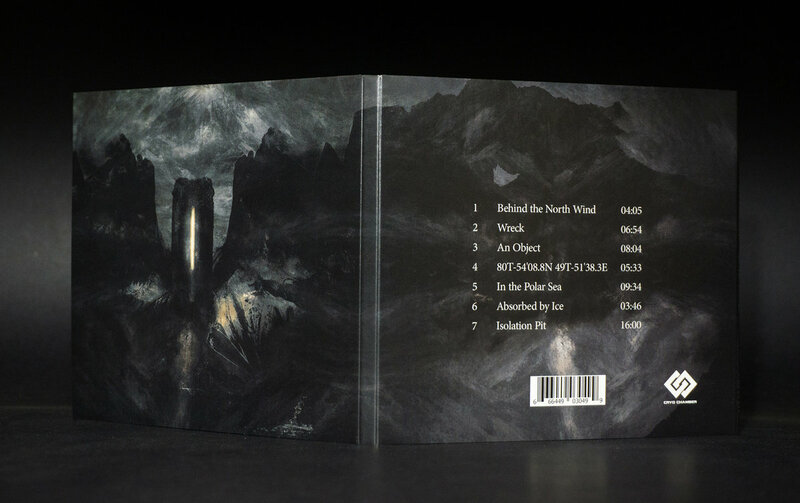 This is cinematic dark ambient at its best, especially if you like the polar theme. Abbildung, meaning in German a ‘mapping’ or ‘depiction’, is the dark ambient project of the Transylvanian, Casian Stefan. 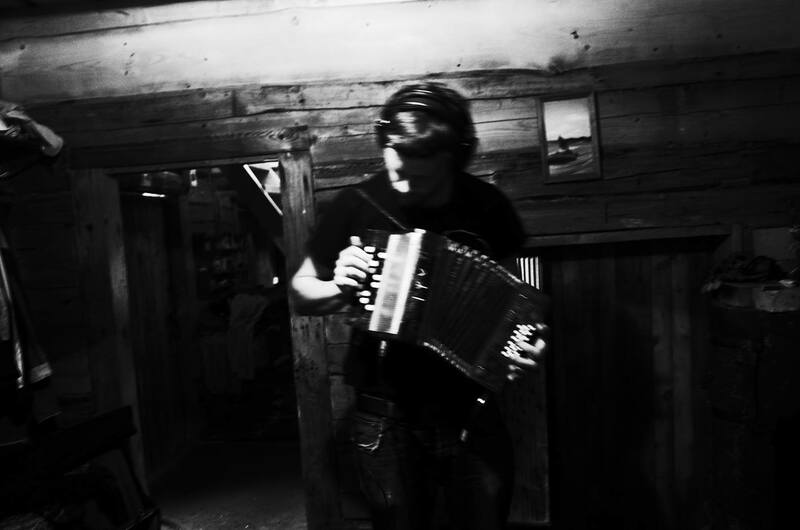 Stefan has been creating music as Abbildung since circa 2005. But, he’s also, at least equally, known through the community as the owner of the Essentia Mundi record label. 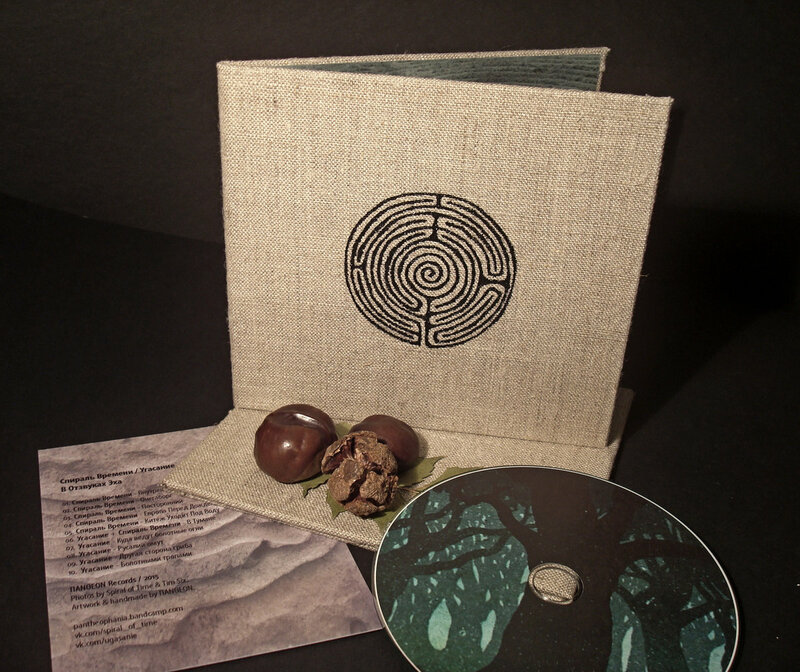 While Abbildung has released the majority of their albums through Essentia Mundi, the last two have been on the Winter-Light label. You can check out my 2015 review of the last album All Demons Are Horned here on Terra Relicta. 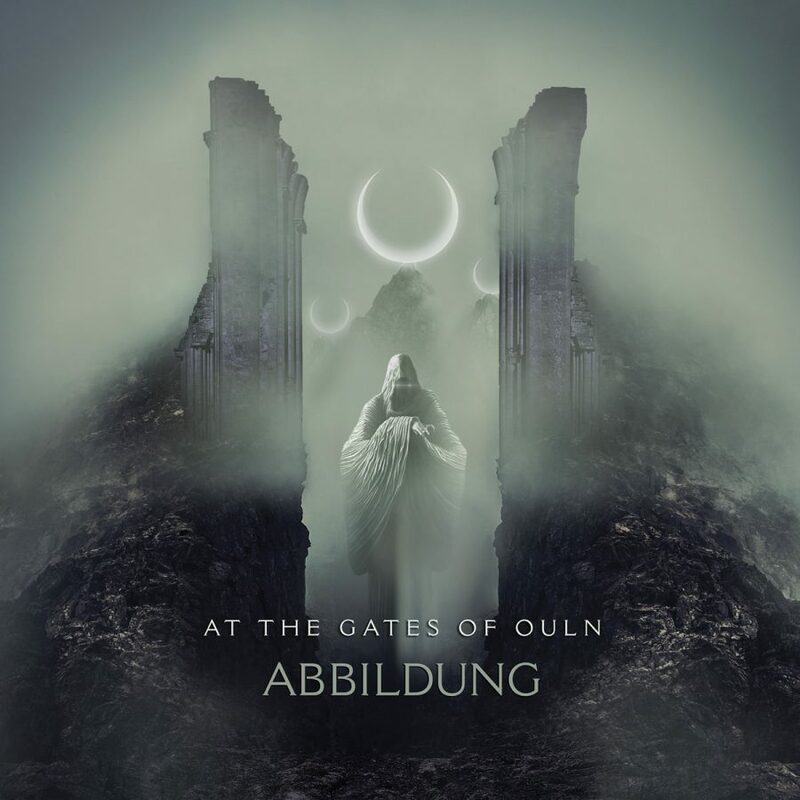 Whereas All Demons Are Horned took an active and varied direction, diverging greatly in style from track-to-track, At the Gates of Ouln is a much more uniform release. This isn’t to say that it is any less interesting, but the tracks seem to progress in a smoother fashion. When choral male vocals fade into “Astrolatry” it does so almost effortlessly. When there are moments of percussion, again, they manage to stealthily fade into and back out of the mix. As an active listen, these smooth transitions give you a reason to pay extra attention throughout the album, lest you miss something. For those incorporating this into their passive listening, during reading, meditation or yoga, you will find the album can be placed perfectly in the background. Able to build a full and reverent atmosphere without sacrificing one’s concentration on the task at hand. I use the word reverent because there is certainly a religious undertone which flows through the album. While the choral vocals being used are likely from a Christian choir, there is no reason to believe that this album should be considered a Christian experience. 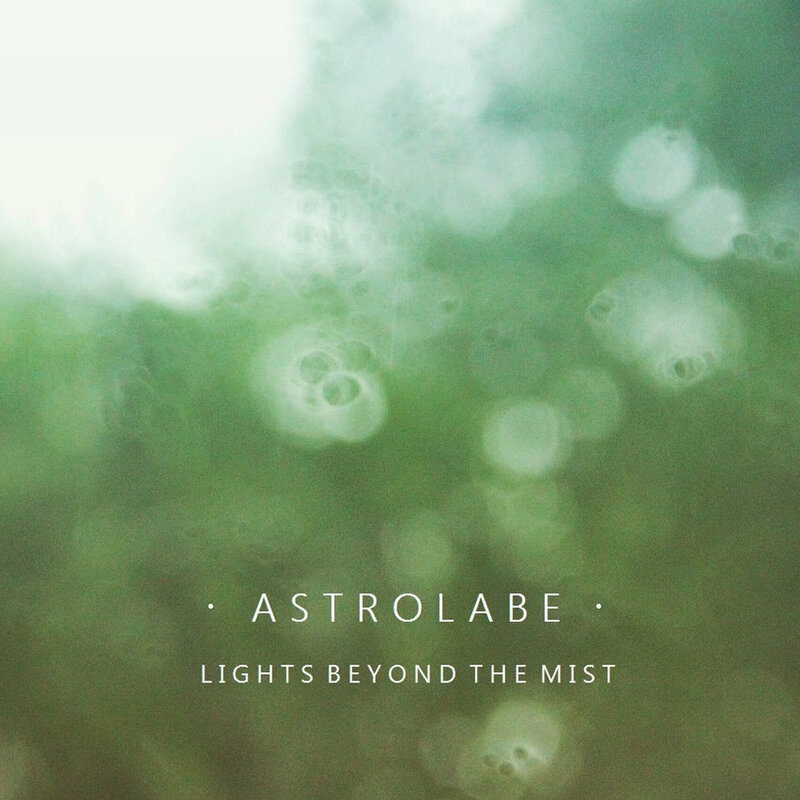 In fact, any hopes of something like that would be quickly dashed, as the beauty of “Astrolatry” shifts into the much darker and more primal “Hymni Zahir”. In “Travellers of Eternal Spheres” we again return to the choral vocals, but this time they are obscured at a great distance. It is almost as if they become part of the shimmering drones which flow around and through them. The darkness of “Hymni Zahir” seems to have corrupted the beauty of the previous track, and “Travellers of Eternal Spheres” is then rendered a twisted combination of the two atmospheres. As “Travellers” draws to its close, after the 10 minute mark, we are moving toward a stiller darkness. 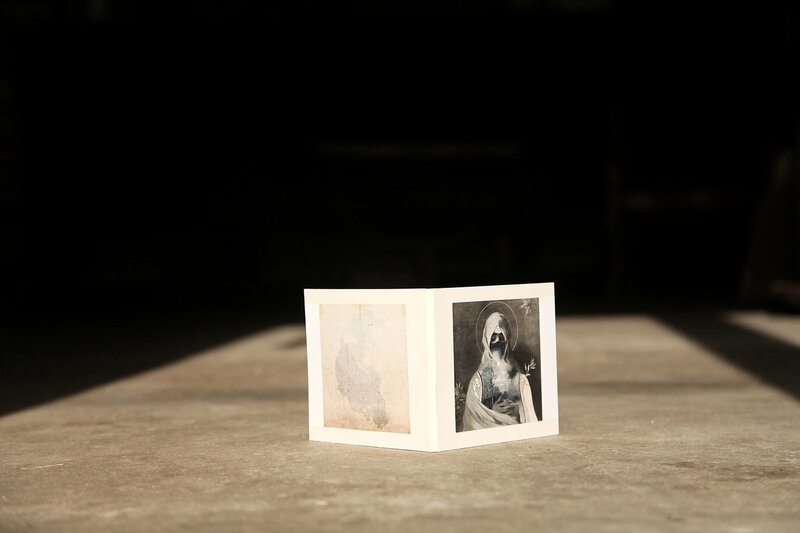 We are left with some subtle field recordings and an ominous set of notes that corrupt and become the silent darkness. “Abyme” truly represents the abyss here. Those dark and lonely notes from the previous track return, giving us a continuation of that motif. The field recordings become more subterranean and pronounced. The drones are almost non-existent. As the track proceeds through this dark soundscape, an unsettling high-pitched noise slowly begins to invade the track, gradually increasing in intensity (mind you the note/noise is nowhere near on par with something like death industrial or power electronics or noise ambient, this is a harsher but thoroughly dark ambient experience, and nothing I would really need to warn a sensitive ear against). Once this sort of demon has been abated by the 10 minute mark, we are again lost in the depths of an all-encompassing darkness which fades into total stillness. 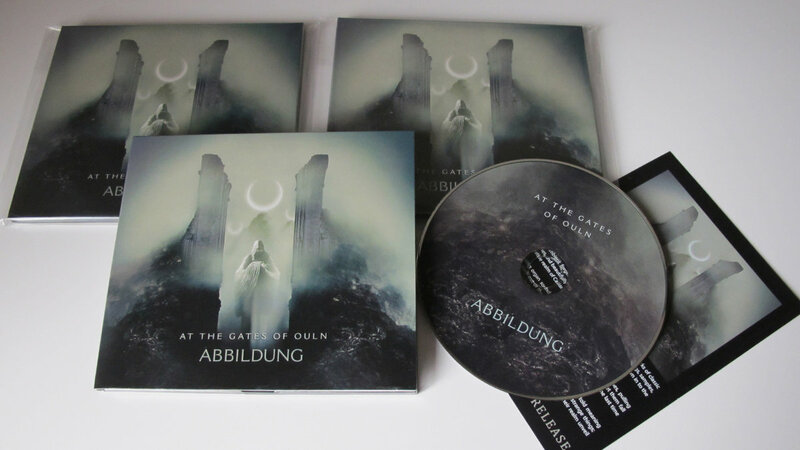 I really enjoyed the last Abbildung album in 2015, and it was my first experience with the artist at the time. However, I found that there were only certain times when I could listen to the album and really allow it to shine. At the Gates of Ouln is a much more versatile album for me, and in the short time I’ve owned the CD it has been played at least several times a day, and never once was it found to be out of place, whatever I may have been doing at the time. I, therefore, very highly recommend this one. This is the perfect introduction to Abbildung if you aren’t previously familiar. For those of us familiar with his past works, this could likely be the best yet. Add a beautiful digi-pak presentation from Winter-Light, and there is really no excuse not to pick this one up! Aindulmedir is the latest project from Pär Boström, known to most in the dark ambient community for his work as Kammarheit and Cities Last Broadcast. Following in the aesthetic the label often presents, mixtures of solitude, mysticism, northern landscapes and nostalgia draw the listener once again into the esoteric worlds presented on Hypnagoga Press. For this release we will quickly notice a new side of Pär Boström being unveiled. 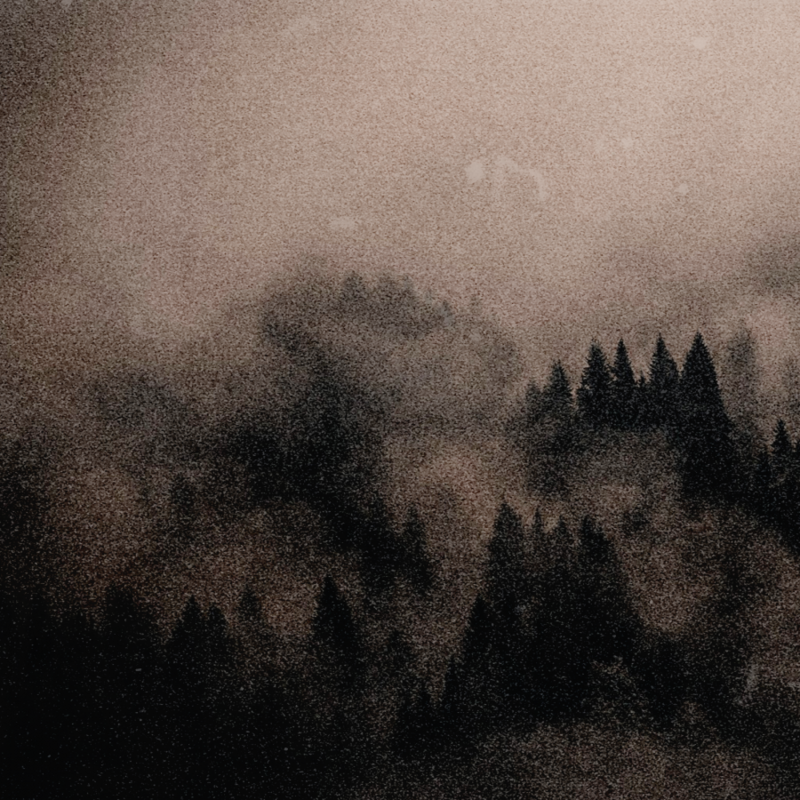 While he often focuses on northern and/or dream landscapes and mysticism in his works, Aindulmedir takes these concepts a little bit outside the confines of the dark ambient genre. Aindulmedir adds a healthy dose of dungeon synth vibes to the mix. But this will not be your standard dungeon synth. 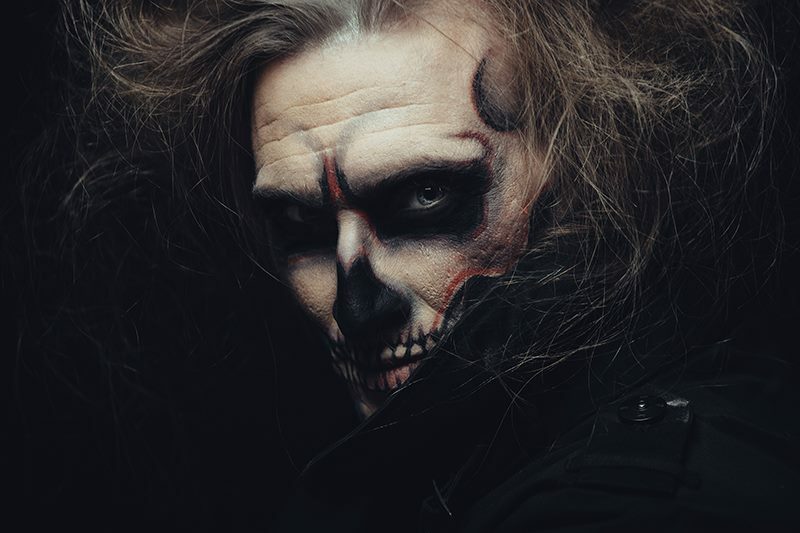 Comparisons to someone like Mortiis wouldn’t make much sense here. The sounds of Aindulmedir more closely align with something like Grimrik‘s debut Eisreich. 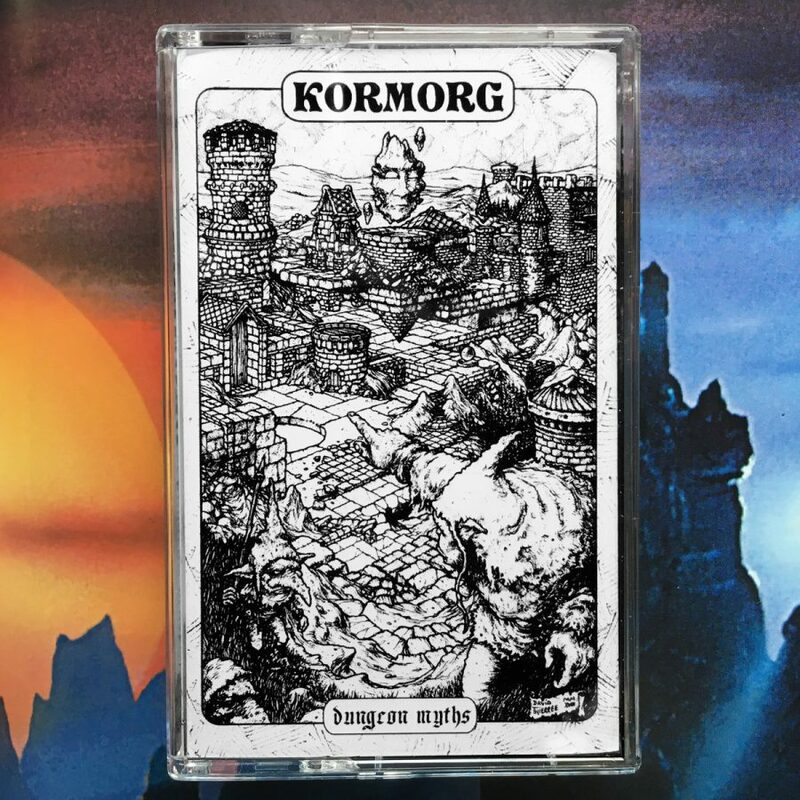 The solitary northern vibes outweigh the fantasy elements here, allowing for a subtlety which is often sorely lacking in the vast majority of dungeon synth releases I hear. The Lunar Lexicon is stated to have some connection to a novel Pär is currently in the process of writing. Now, we can all begin to obsessively wonder what mysteries might be in store for us within the pages of this novel. As far as I’ve seen, this is the only public mention of such a work, so we can be sure that frigid climates and magickal books (and maybe even a wizard?) will be part of this narrative. But as the album description says that the music is “crossing the borderlands of a novel Pär is writing”, we are left probably with more questions than answers. I, for one, am incredibly excited about this news. The album is also said to be “winter music for bibliophiles and hermits”. For those of us in the northern hemisphere, that makes now the perfect time for enjoying such a work. As our world slowly shifts we’ve been seeing vast accumulations of snow across various and often random sections of the world. There is no better time to sit down with a great book, a cup of hot tea or coffee, and Aindulmedir on repeat in the background. I continue to be surprised by the ability of Pär Boström to continue expanding his musical output into new projects, while also moving forward with the others. 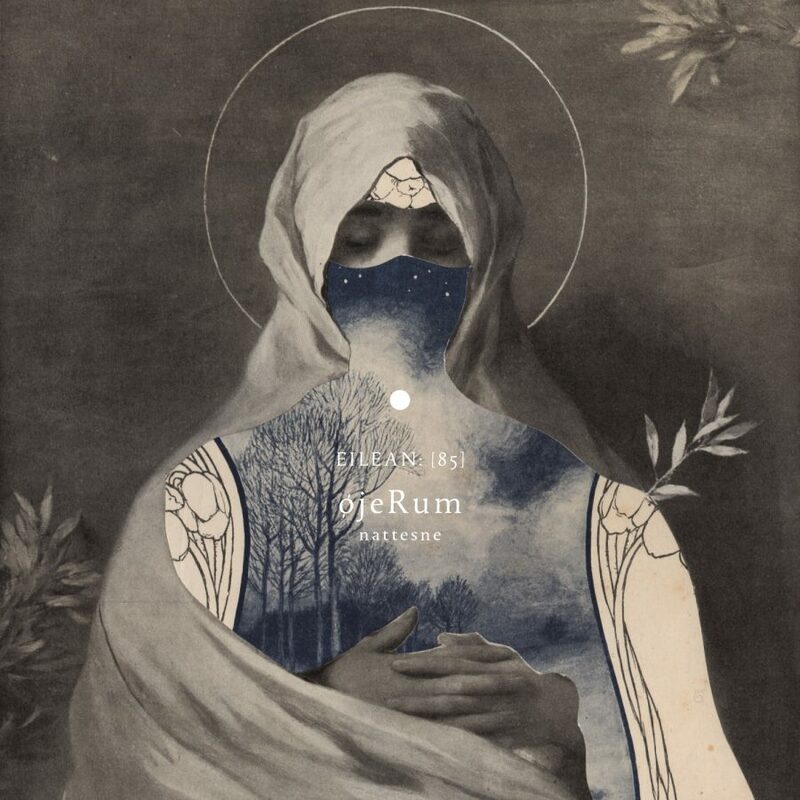 I get a bit of a Kammarheit vibe from “Sleep-Form” but really this album sounds nothing like any of the other releases I’ve heard from Boström (of course, not all his works are solo, some like Hymnambulae include his sister Åsa, and Altarmang includes Kenneth Hansson). It will be increasingly interesting over the years to come, as we see how these various projects will all advance and morph. 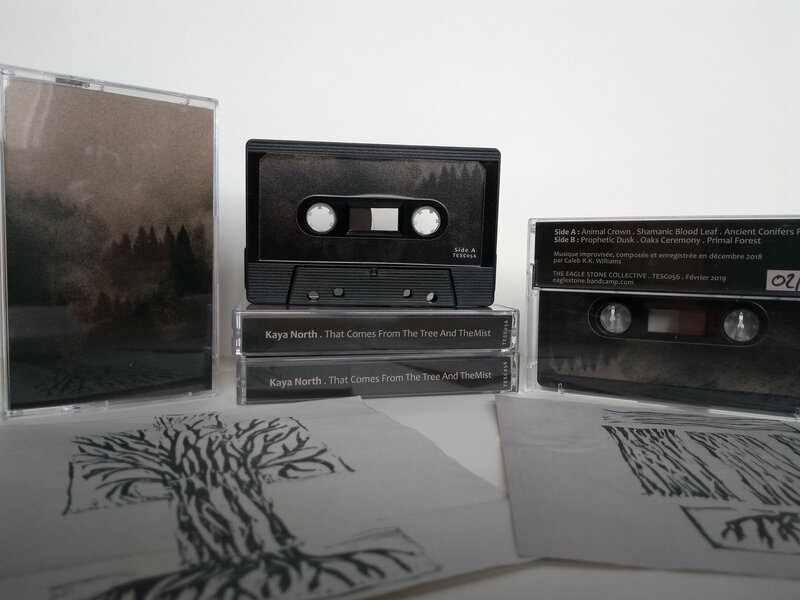 The album was released digitally as well as in 30 limited edition cassettes. The cassettes were sold-out in something like two hours, so it looks like the community is certainly keeping an eye on these limited edition releases. From their past statements, it seems we can expect to see more of these sorts of ultra-limited edition releases in the future. However, other releases like the Hymnambulae debut, Orgelhuset, were pressed in a much larger quantity, so I guess there will continue to be a bit of each. Since I first discovered the genre of dark ambient, Kammarheit and Cities Last Broadcast have both been incredibly important to me. It’s great a few years later to see Pär Boström taking his work in new and varied directions, while still staying faithful to his original projects. The Lunar Lexicon by Aindulmedir is yet another utterly magnificent release to add to that already impressive list. VRNA (Urn/Ossuary), occasionally labeled as Urna, is the industrial/ritual/dark ambient project of Gianluca Martucci. Martucci has been creating music under this guise out of Italy since 1998. Starting his career with releases on Slaughter Productions, VRNA has been a solid, but under-the-radar, project which has caught the attention of those with discerning ears for two decades. Tattoo artist by trade, Martucci uses VRNA as his bridge into more mystical realms. Referring to the music as “…reflect[ing] the vacuous psychedelia of an ancient mind casting spells in a modern world” we can see that the sounds created here are intended to work on a higher level than that of a passive-listening ambient release. The album is incredibly dynamic, at moments slowing to a meditative lull and others reaching moments of utter chaos and frenzy. The overall quality of the production seems to deteriorate at moments, writhing in raw energies before returning to a perfectly balanced state. Percussive elements range from dispersed single beats to fully realized tribal dance rhythms to droning silences. As a ritual ambient piece, it takes the listener through a full experience, seemingly able to direct states of consciousness in strange ways, if one were to properly open themselves to it. “Of Great Silence” starts with a mid-high range oscillating airy drone. Male chants enter the mix after a few moments. The chants slowly fade into a distorted oscillation, mimicking the dronework. “Ritual of Self-Burial” is simultaneously unnerving and serene. It seems to convey a sense of destructive action with perfectly calm intent. This feeling is certainly reinforced by the track title. This is quite an amazing track in comparison to other similar attempts at this style. It really showcases Martucci’s natural grasp of ritual, industrial and ambient music and how they can all converge in the hands of the right aural alchemists. After the chaos of the previous track, we move into “Empty”, another highlight of the album, which keeps a subdued level of energy. We are able to envision ourselves in some dark catacomb, witnessing an ancient rite. Wind whirls through the chambers as the chants and incantations echo off the dank stone walls. One can almost smell the combination of torch fuel and frankincense wafting through the chamber, burning their nostrils. As the track moves toward it’s close a clean piano piece enters the mix as the surrounding sounds all descend back into distorted chaos. The moment is reminiscent of some of my favorites in the works of Dahlia’s Tear, but the theme, setting, and therefore also the effect are quite different. 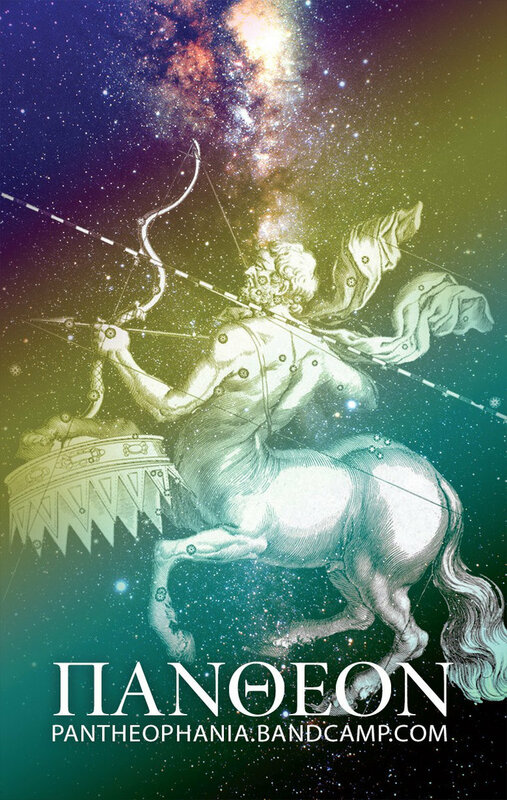 “Cenere” descends the furthest into chaos. The track mainly consists of a repeated vocal chant which is highly distorted along with an array of drones which create a sort of sonic assault upon the senses. Deep reverberations seem to usher in a powerful and malign force. “Campi di Polvere” starts calmly, a lonely guitar riff plays over an airy drone. It feels like a nice meditative calm amidst the intensity of the surrounding tracks. “La Vecchia Madre – Ritual of Awakening” returns to the oscillating high-pitched industrial drones. There are words spoken over the drones using heavy distortion and delay to create a demonic sort of sound which intensifies into screams and growls over a slowly pounding drum. As the track progresses toward its close, it descends further into a distorted chaos. In seeming conclusion to the entire ritual/album the sound fades out, being replaced by a more primal style of tribal music. A single chanting voice prepares the scene for the aforementioned tribal dance rhythms which are joined by a number of other chants, male and female included here. This won’t be an album for passive listening. One should really dedicate themselves to the experience of this one in order to fully and properly appreciate it. 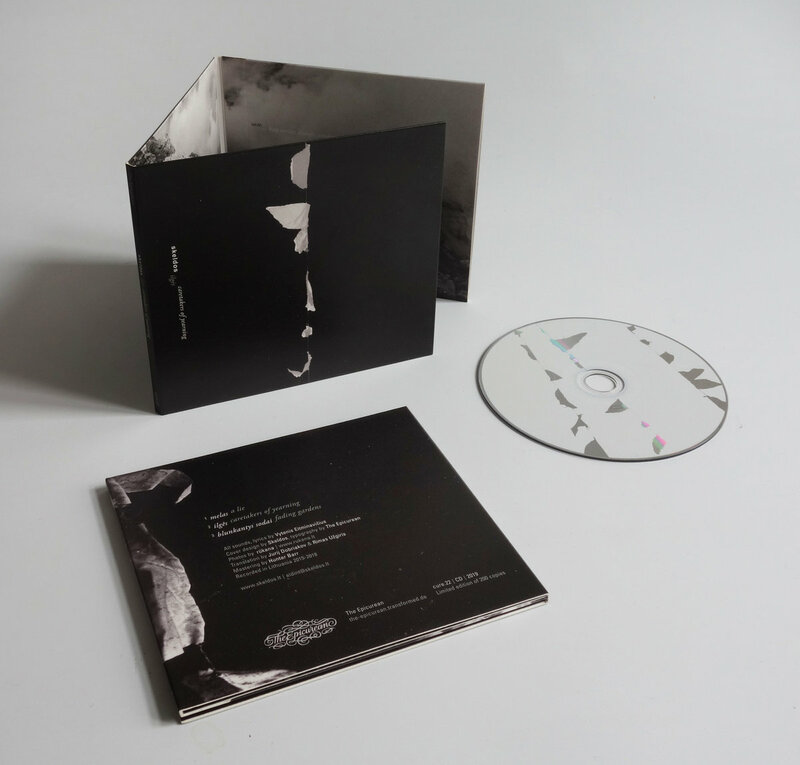 Released on Old Europa Cafe, La Vecchia Madre comes in an almost cloth or leatheresque textured digipak. As it’s a good album to put your focus toward, I would definitely recommend the physical for taking on driving excursions and the like. 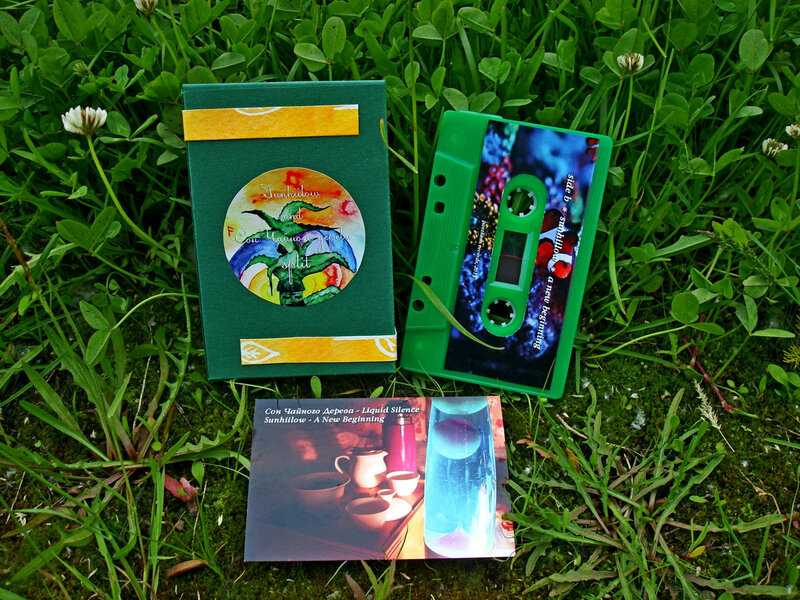 VRNA has been involved in a number of noteworthy releases over the last few months, a few of which include their split with Holotrop, Enkoimesis, and the brilliant compilation Sons of an Older Cosmos. Both of these were through Qualia. There are certainly a number of other previous releases from this artist that are well worth discovery. If you are a fan of ritual ambient that isn’t afraid to take things into intense aural territory, you should find a lot to love on La Vecchia Madre. Those that prefer their ritual ambient subdued and meditative will have a harder time with this one, but could still catch a few of you pleasantly by surprise, as it did with me.